View More In Candlestick Holders - Page 9. When someone we love becomes a memory, that memory becomes a treasure. Light your way memorial by pavilion gift company is a beautiful line of home and garden treasures created to keep your loved ones' memories alive while brightening our hearts and home. The warm yet subtle earth tones complemented by symbolic blue forget-me-nots and compassionate sentiment will bring the memory of a loved one to life. 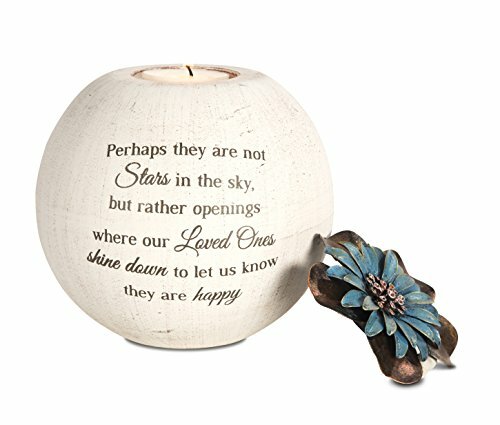 Reads "perhaps they are not stars in the sky, but rather openings where our loved ones shine down to let us know they are happy"
If you have any questions about this product by Pavilion Gift Company, contact us by completing and submitting the form below. If you are looking for a specif part number, please include it with your message.